Vying all the time, recruiters and hound dogs have a lot in common. You see, canines possess killer searching skills. They’re forever sniffing out other animals, working out who they are, where they’ve been and their overall suitability as a mate. In many ways, recruiters are sniffers as well, sniffing for a living. In a less physical sense they’re forever following their nose, sniffing out candidates’ skills and suitability for a role. They are so unbelievably good at it, it’s almost ‘a sniff’ they were born to do it. Both hound dogs and recruiters are natural-born hunters too, known for their determination and persistence (and occasional stubbornness). Where recruiters hunt talent and new business opportunities, the dogs track down people, animals and other unidentified objects. Both beings share an innate sense of inquisition and curiosity. They’re also extremely social and great with people. See? Peas in a pod. While the similarity is uncanny, there are still many different types of recruiters, so which breed of hound dog are you? Beagles are extremely cute, but they can also be quite stubborn. They are known for blindly following a scent and are hard to deter when they think they’re onto something. They are also quite loud-mouthed and are known for barking a lot. If your phone voice is the same voice you use to cheer on your football team in the semis, you could be a Beagle. Basset Hounds have a really pleasant nature and are easy to be around. They are peaceful dogs, affectionate and friendly. Like beagles, when they are following a scent very little can stop them in their tracks. Now before you start telling everyone you’re a big ol’ basset hound, note that these guys are known to be big slobberers and struggle with flatulence issues. Still sound like you? Afghan Hounds are an ancient breed of hound dog. They embody wisdom, are sensitive and elegant. If you’ve been in the recruitment game a long time and are wise beyond your years, this could be you. The name is a little bit misleading here. Bloodhounds are gentle beings, but tireless when following a scent. Their intense tracking abilities make them difficult to train. If you find yourself rolling your eyes at training courses, all the while wishing you were out working on the job, you may have just found your spirit animal in the Bloodhound. Go, go, go! Greyhounds are absolute racers, so don’t even try to catch them. These dogs are good at eyeing the prize and chasing it down, vying for the top spot ahead of the pack. They don’t respond well to heavy discipline, but need a clear sense of direction to be communicated to them. See below a picture of a Greyhound on public transport. If you did a double-take thinking it was actually a picture of you, you know which breed you are. Forget keeping a low profile (mind the double entendre), these guys like to play a lot of games. Sometimes they are referred to as wiener or sausage dogs. Dachshunds are full of life, very clever and also possess strong digging instincts, making them excellent recruiters. 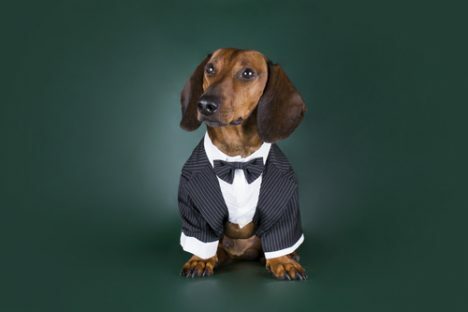 If you’re a bit of a prankster or joke-cracker, or just look great in a suit, you’re probably a Dashchund. If you’re unsure which one you are, we recommend you engage in some light reading about dog breeds.